The certificate programme of the Section for Teaching and Learning in Higher Education consists of three modules that result in 140 work units (AE). It takes about one to one and a half year to complete the certificate program. A new program cycle starts at the beginning of each semester. The programme primarily addresses junior scientists with a teaching position at the University of Göttingen; more experienced lecturers are welcome as well. The certificate programme is usually conducted in german. 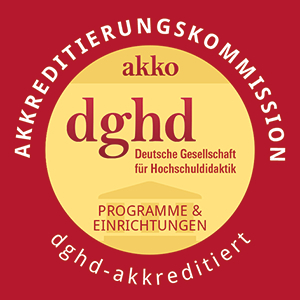 If you are interested in participating at this programme please don't hesitate to contact us: hochschuldidaktik@zvw.uni-goettingen.de. Furthermore you are welcome to have a look at our open workshop programme in which we offer some english workshops regulary. The objectives of the programme are to introduce and critically reflect central ideas and methods of teaching and learning in higher education, to support the participants to develop their teaching skills further and to facilitate the transfer between theory and real life. Within the certificate programme, we work in interdisciplinary groups of no more than 12 people and in various settings (e.g. workshops, collegial sit-ins). The groups pass the certificate programme together. Module 1: During the first module (54 work units) the participants are being introduced to basic theories and concepts of academic (and adult) teaching and learning. Based on these, each participant (re)evaluates her or his understanding of learning in higher education and critically reflects the teaching philosophy that evokes this understanding. Additionally, the participants get to know, experience, and reflect ways to facilitate (academic) learning (esp. methods to engage students and ways to communicate & present during lectures and seminars). Module 2: In the second module (54 work units) the participants expand and refine their knowledge on academic teaching and learning. Based on the topics and action of the first module, here the participants acquire competencies on assessing and consulting students. Furthermore, each person may choose one additional workshop based on her or his own interest and needs. Since this module also fosters the connection between the certificate program and the real teaching experiences, it includes a collegial sitting-in as well as critical friend meetings to discuss challenges faced during the teaching semester. Module 3: While the first two modules are being organized as group- and situation-oriented trainings, the third module (32 work units) focusses on the individual transfer. This includes the reflection on one's own teaching believes and teaching practices and its documentation in form of a teaching portfolio. Der Teilnahmebeitrag für das Zertifikatsprogramm Hochschuldidaktik beträgt 500 Euro. Der Teilnahmebeitrag für das Zertifikatsprogramm Hochschuldidaktik PLUS beträgt 200 Euro. Im Zentrum steht hier die Reflexion des eigenen Lehrhandelns, die einen Wandel von einer lehrprozess- zu einer lernprozessorientierten Haltung erzielen soll. Die anspruchsvolle Aufgabe der Lehrenden steht im Fokus, um Studierende bei der Entwicklung wissenschaftlicher Arbeits- und Denkweisen kompetent zu unterstützen und zu begleiten sowie diese auf inner- und außeruniversitäre Berufsfelder vorzubereiten. Die bisher erworbenen Grundlagen werden um die Themen „Beraten“ und „Prüfen“ erweitert, die eine zentrale Rolle für das Lernen der Studierenden im Hochschulkontext spielen. Der Fokus liegt – von der individuellen Situation ausgehend – auf der Möglichkeit, themenspezifisch das eigene hochschuldidaktische Wissen zu vertiefen und innovative Konzepte oder Leitideen der eigenen Lehre zu entwickeln. Dieses Modul stellt den Transfer des Gelernten in die eigene Lehrpraxis sowie die Reflexion der eigenen Einstellungen, Haltungen und Rollenvorstellungen im Bereich der Lehre sicher. Dazu dient der intensive, kollegiale Austausch, der neben zwei kollegialen Praxisgesprächen und der kollegialen Hospitation auch ein Lehrportfolio zum Abschluss beinhaltet. Die Themenbereiche des Zertifikatsprogramms, wie Gruppendynamiken, Phasen des Gruppenprozesses und die Rolle der Lehrenden in Bezug auf die Gruppe der Studierenden, werden um das Themenfeld „Gruppen leiten und führen“ ergänzt und durch die weiteren Inhalte „Gruppenentwicklung und die Leistung von Gruppen“ sowie „Machtverhältnisse und Konflikte in Gruppen“ vervollständigt. Aufbauend auf dem gemeinsamen Erfahrungshintergrund des Zertifikatsprogramms, kann die Arbeit in einer festen Gruppe als Reflexionsanlass genutzt werden. Die thematische Ausrichtung wird individuell und in Absprache mit der Hochschuldidaktik abgestimmt, die die Durchführung der innovativen Lehrprojekte umfassend begleitet.